suitable wooden shelving units for your small corner, limited space. You could put it on the bedroom, study,living room,office,kitchen. Material:Laminated particleboard and metal,steel wire. Wooden Shelving Dimension(L*W*H):23.6"*13.8"*58.3". Package size is(L*W*H):46.06"*13.4"*2.56". Packaged with 5ply corrugated carton. Useful: 4 shelving unit for your kitchen,bathroom,library, garage use, as a corner shelving unit, save your space, organizer your home. 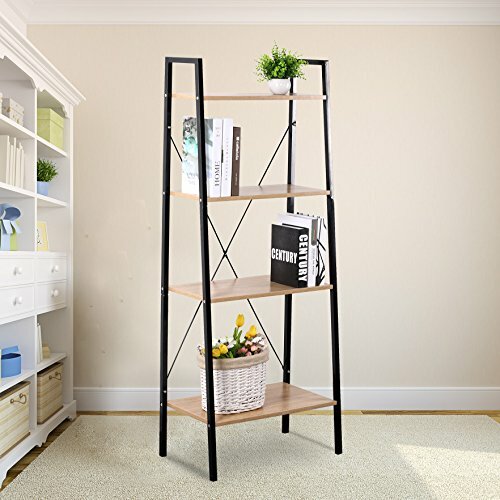 Storage Shelving Material: Made of durable sleek Laminated particleboard and fixed with sturdy steel wire. Heavy Duty and Adjustable Shelving:Each Shelf can hold up to 30 bls. Assemble:With clearly instruction attached, easy and quick to assemble.